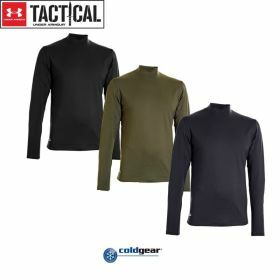 Core temperature regulation and superior moisture transport in a Crew neck, ensuring a stealth fit beneath your uniform or outerwear. Heat-trapping brushed fabrication delivers a slip-on feel or added comfort. Heat seal logo on left chest. ArmourBlock(TM) technology bolsters odor suppression. Material: 89% Polyester (TM) / 11% Elasthan.